Like most 250-gamers, Dale Morris has had plenty of challenges over the journey. Matthew Boyd pens a tribute to good friend Dale Morris for AFL Players. "I want to play on for as long as I can"
A highly dependable backman, Dale Morris has the versatility to line up on both taller and smaller opponents, assuming a key post or playing on a flank. Named in the All Australian side in 2008, Morris's experience and leadership is invaluable. Morris joined the Western Bulldogs rookie list in 2005 after impressing for Werribee in the VFL. Morris was a mainstay of the Bulldogs back-six throughout the 2016 season, and a member of the Club's leadership group. Despite a back complaint through the finals series, Morris played a key-role in all four finals victories, standing atop the podium as a premiership player on the first Saturday in October. A cornerstone of the Bulldogs’ defence since his arrival, only injury could deny Dale Morris adding more than the 11 games to his career tally in 2017. On the field Morris continued to show his durability and resilience, averaging 90% game time in his matches – among the highest at the Club – while his selflessness and defensive contribution was reflected by the 7.8 one percenters he averaged per match. A broken leg sustained in round one against Collingwood saw Morris miss seven weeks at the start of the year, while an ankle complaint had him miss the round 12 loss to the Swans in Sydney. Morris returned from a badly broken arm (round 18, Gold Coast) to play against Port Adelaide in Round 22. Despite needing surgery, he only missed three matches with the injury, furthering his reputation as one of the ‘Iron Men’ of the competition. 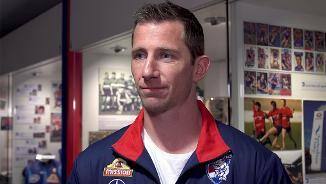 Morris will prepare for a 13th AFL season next year after re-signing at the Western Bulldogs on a one-year deal in September. “The biggest moment for mine was the last game of the season with the two old boys retiring in Murph (Bob Murphy) and Boydy (Matthew Boyd)." 13 disposals at 85% to go along with five marks per game, Dale Morris was a stalwart down back in 2016 as he has been his entire career. Once again he would be called upon to battle players both tall and small, and once again he would deliver. In round seven he stood Eddie Betts (173cm), Jack Riewoldt in round 16 (195cm) and in round 17 it was Gold Coast’s Peter Wright (203cm). While forever the steady hand, playing through serious injury, Morris’ finals series was something special. His lunging tackle on Sydney’s Lance Franklin in the final quarter of the grand final will go down in footy folklore. “This year has been a challenging year for the Club. You look at all the injuries that we’ve had throughout the year and the challenges we’ve faced, so to get to where we got to is just a phenomenal effort. While the work of Robert Murphy and Matthew Boyd was spoken about at length in 2015, Dale Morris’ influence was just as important. The 32-year-old once again took on the opposition’s best, playing on mainly small to medium forwards over his 14 games this season, but at times playing on the opposition’s key forwards – a role Morris has become accustomed to over his career. Morris was sidelined for eight weeks from rounds 4-12 with a pectoral injury, and returned for one match through the VFL – delighting Footscray fans. 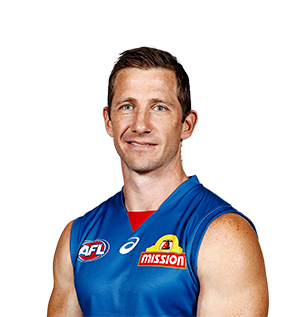 The veteran defender joined Murphy and Boyd as the leaders of the Dogs’ defensive unit, and was reliable, consistent and efficient. Morris was also nominated as the Club’s most courageous player in the AFLPA MVP awards. Morris finished fifth in the league for effective disposals per game, at 87.1 per cent. “This year with Bevo coming in, he actually wanted him to play on a smaller guy and sometimes play on a key forward but maybe look at the medium and small forwards for the opposition. “Moz had a hampered pre-season which hurt him a little bit and then he got injured pretty badly against Hawthorn… But him coming back into the side, I think he played the last ten games in a row, and there’s no coincidence that our back line grew in that ten weeks. The ever-reliable backman played 20 games in 2014 at 84.6 per cent disposal efficiency. Morris gave away a height advantage on the majority of his opponents in 2014, but fought hard and provided much needed experience in Dogs defence. Morris averaged 11 disposals and signed a one year contract half-way through the year, and will continue to provide a mentoring role for many of the Dogs younger defenders. Morris ranked 17th in the league for one percenters, highlighting his ability as a ‘team-first’ player. “It would mean a lot (to play finals again). We’ve really had to work hard to build this team back up so it would be great to be a part of it when the club does get back to the successful times and finals. “It will also be rewarding if we are there to enjoy the spoils that we know we have had a big part to play in the future of this club. It’s something you can sit back and take a lot of pride in.” – Morris following his contract extension in July 2014. 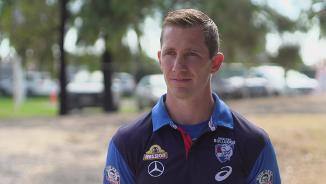 On the comeback trail from a long-term leg injury, Bulldogs favourite Morris returned to his best in 2013. The stalwart defender played every match, recapturing the ruthlessness to handle the competition’s most dangerous forwards. Teammates, coaches and fans alike have come to know and love the defender’s courage and were delighted to see Morris duly presented the Scott West Most Courageous Player award at season’s end. Notching more one percenters than ever before (seven on averages), Morris’ courage and willingness to put his body on the line cannot be underrated. A seven week purple patch in the middle of the season also saw the 30-year-old average nine one percenters per game. Morris also had five games in which he laid five or more tackles. Season 2012 was spent predominantly on the sidelines for Morris as he worked tirelessly to overcome a persistent leg injury. One thing that cannot be denied is his resilience and optimism through the testing period. After playing a quarter of football with the VFL Reserves in April, Morris was forced back into the rehab group with a stress fracture. The highly respected veteran has been working hard to set himself up for a big pre-season ahead of 2013. The ever-reliable defender was stuck-down by a horrific injury in Round 21 after a fantastic season in defence. Morris broke the tibia and fibula bones in his right leg against Essendon and was lucky enough to avoid surgery. In his 18 games in 2011, he registered a career-high 23 disposals against St Kilda in round 12 and finished fifth in the Club’s best and fairest. Morris worked tirelessly in the rehabilitation group over the summer.